Every meal time is both a social event and an opportunity for culinary discovery at our Auang Doi restaurant. 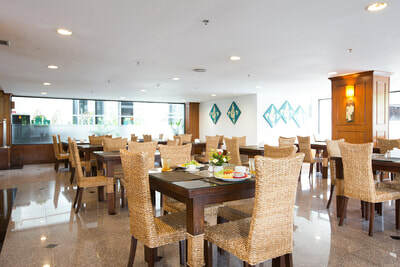 Our all-day dining restaurant prides itself on its delicious and varied, Thai and international breakfast and lunch buffets and always extends a warm welcome and delectable dishes whenever you drop in, from early morning till late in the evening, from its extensive creative a la carte menu as well. Located on the ground floor with a greenery view, it's light and airy during the day and a pleasant place to sit, relax and revel in the flavors through sundown into the night. Naturally, Northern Thai, or "Lana" cuisine, is a specialty and our local chefs are true experts in making the most of the ingredients to be found throughout the region, fine-tuning traditional recipes first created generations ago, and being inspired to bring new ideas to the table, too. Our well-qualified and experienced kitchen team is equally adept at recreating the comfort food standards of Europe, America and Asia with authentic ingredients, so there truly is something for everybody, whether they're feeling nostalgic for home or up for a culinary adventure. Open daily: 11:30 - 21:00 HRS.